The autism epidemic seen in most Western countries in the past 30 years is one of the great medical mysteries of our time. The cause cannot be some great genetic shift – there simply hasn’t been enough time for this to have happened. Our diets are not hugely different and there is nothing to suggest any other aspect of our lifestyles might be to blame. One rather bizarre hypothesis, that certain combinations of vaccines given to toddlers might be to blame, has now been thoroughly discredited. One ‘explanation’ is certainly over diagnosis; fifty years ago ‘autism’ was quite narrowly defined, a serious mental impairment which normally prevented sufferers taking a place in mainstream society. Now children who are simply a bit obsessive or who show signs of social dysfunction are routinely labelled ‘autistic spectrum’ or ‘Asperger’s’. But over diagnosis cannot explain all the rise – from one-in-2500 in the United States to around 1% today (and similar rates in the UK). For some years now Professor Simon Baron-Cohen (cousin of the comedian and actor Sacha), a psychologist at Cambridge University, has been developing his theory that something called ‘assortative mating’ may be at least partly to blame for the spectacular rise in autism diagnoses. The theory states that when people with strongly ‘systemising’ personalities – the sort of people who become engineers, surgeons, computer experts and who shine in some aspects of business – marry each other and produce children, the effects of this kind of ‘male brain’ are genetically magnified, increasing the chances of producing an autistic child – a child with what Prof Baron-Cohen suspects is an ‘extreme male brain’. Strong ‘systemisers’ are often slightly obsessive, perfectionist and make great scientists and are often extremely talented at music. But they sometimes have difficulties socially interacting with other people – a combination of traits that can blend into the milder end of the autism spectrum. Cambridge University’s Autism Research Centre is now asking members of the public who are graduates and parents to take part in a survey which will investigate any links between educational achievement, what kind of job they have and how their children develop. Specifically, the new study will attempt to find out whether two ‘strong systemisers’ do indeed have a higher chance of producing autistic children. Prof Baron-Cohen’s theory is certainly plausible. Some of the sharpest increases in autism diagnoses have been found in Silicon Valley, in California – home to perhaps the largest population of successful systemisers on Earth, the tens of thousands of technicians, engineers and programmers who work in the computer industry. Inevitably, many of these people marry each other (there are now plenty of women working in IT, not the case a generation ago) and this is good (although circumstantial) evidence of the systemising-autism link. But what about other places? Why the rise in autism just about everywhere? One answer could be the changing role of women in general seen in the last 100 years. Until relatively recently in our history, being exceptionally bright was not much use to you if you were female. In Victorian Britain, for example, the opportunities for a woman to earn her living through brainpower alone were extremely limited. According to the 1901 Census, there were fewer than a hundred registered female doctors in the whole of the United Kingdom. Going to university was difficult and expensive – most did not even allow girls to study. There were certainly few opportunities for careers in engineering or the sciences. You could become a teacher or a governess, or maybe, of you were exceptionally talented, earn your living writing or in the arts. Most of the professions were closed, as was the world of business. Brainy women were not even seen as particularly desirable partners. Clever or rich men chose brides on the grounds of looks, ‘breeding’ or both. Having an IQ in the 140s probably counted against you if anything. The traditional image of a ‘dumb blonde’ hanging off the arm of the successful politician or businessman was a horrible cliché but it had an element of truth. And in any case, very clever women would have often been mad to get married. Until the 1880s British women who wed could not even own their own property. If they she did have a job, many employers would automatically sack a girl the moment she turned up with an engagement ring. So many clever, ‘systemising’ women simply did not marry, or married late – and probably had fewer children when they did. Now everything has changed. Not only have the legal and social barriers to women entering the workplace as equals been largely dismantled, we also have the phenomenon of the desirable ‘alpha female’. Fifty years ago many men were scared of smart women. Now, increasingly, alpha males want someone their equal or eve superior. Fifty years ago, male airline pilots typically married stewardesses; now they marry other pilots. Doctors used to marry nurses; now they marry other doctors. The wives of successful politicians are, increasingly, successful in their own right – and of course many successful politicians are women. Prof Baron-Cohen points out that ‘alpha females’ are not necessarily strong systemisers. Being a brilliant politician or writer may not require the sort of geeky ‘male brain’ that may lie behind the autism rise. But the phenomenon of like-marrying-like may be having completely unexpected consequences that go far beyond mere equal opportunities for women. It is a fascinating theory and we await the results of the new study with interest. Not Stupid offers a readers a rollercoaster of emotions but most of all it offers a real sense of hope for those whose lives are affected by autism. When Anna and Sean Kennedy discovered that one of their sons had asperger’s syndrome and that their other son was autistic, they were truly devastated – but their family’s troubles were just the beginning.Turned away by no fewer than 26 special needs schools when searching for appropriate educational facilities for their boys, Anna and Sean were down – but not out. Anna was determined to prove that for children like their sons, the challenges of growing up with autism – to demonstrate to the world that they were simply Not Stupid – did not have to end in defeat. Through sheer guts and determination, they turned their situation into a victory by establishing a centre of excellence for the care and support of those with autism. With more than half a million people in Britain affected by autism, it is little wonder that their school quickly became over-subscribed – proof that educational provision in this field is inadequate in the United Kingdom today, and proof also that it is still possible to transform a vision into reality through simply not giving up. Anna’s story, and that of her ever-improving sons, is a beacon of inspiration for parents of special needs children all over the country. 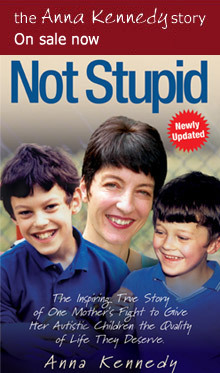 Not Stupid offers a readers a rollercoaster of emotions but most of all it offers a real sense of hope for those whose lives are affected by autism. I would like to bring your attention to a really shocking situation that now exists in mainstream schools across Britain and I have prepared the following information from a recent survey which I hope you will feel able to publish in your newspaper in order to highlight the terrible plight of children with Autism who are being bullied in our schools on a daily basis, simply because of their condition. Despite facing tremendous difficulties children with Autism can, with care and specialist support, really blossom and develop to fulfil their potential. You will recall James Hobley, an 11 year old who suffers from autism, who grabbed the nation’s attention recently when he entered ITV’s Britain’s Got Talent show and performed dance routines to rapturous response over many weeks. James eventually came 8th in the competition. I have met James and he told me the heart-breaking story of how he was bullied regularly at his local school, which of course was not equipped to deal with children with Autism. He explained how he was tormented, both physically and mentally, and despite appeals to teachers none of them took notice so the torture continued. Eventually James plucked up the courage to tell his parents and they acted swiftly to have him moved to a new school where teachers were more understanding and aware of the issues involved. Ironically one of the reasons James was bullied was because he was into dance and the other kids teased him about his hobby. I have recently conducted a national survey of over 900 parents of children with Autism in Britain and……..it reveals that over 60% of children with Autism have suffered from bullying at mainstream schools and the problem is being largely ignored. Of those questioned 61.0% reported that their child had been bullied at school as a result of their Autism Spectrum Condition (ASC). Even more disturbing was the fact that schools are simply not addressing the problem with 73% saying it had either been ignored or was poorly handled. The startling survey results also reveal that a huge 93% of parents believe their children’s progress at school has been seriously affected, and 96% saying that their child’s ASC makes them much more vulnerable to bullying and teasing by other children. It seems that parents of children with ASC are fighting a constant battle as they try to get a good education for their offspring and also protect them from some of the harsher aspects of everyday life in today’s schools- 89% of the survey sample said that their children found it difficult to mix with their classmates out of school hours. It is estimated that as many as 1 in every 64 children now has some form of ASC in Britain and this latest survey suggests that the problem has been growing for some time with 88% of respondents saying they believed the number of children and adults with ASC has increased significantly in the last decade. The research also revealed that having a child with ASC can put a real strain on a couple and other members of the family. 74% said that having a child with ASC had a negative effect on the parents and other members of the family and 65% said there was a negative effect on their marriage or relationship. I believe this is a national scandal. This survey makes such depressing reading and shows that the problem of ASC is getting more prevalent in Britain and as a society we are not doing enough to support children and their families in this situation. The results also confirm the tremendous strain this condition places on parents who need special carers and educators to help with their children. The Government must not ignore this problem because it is not going away and is getting worse. We must increase the number of special needs schools or facilities within mainstream establishments if we are going to tackle it effectively. Gladly there are people such as Esther Rantzen, founder of ChildLine and the patron of the school I founded for those with Autism, Hillingdon Manor School, who are campaigning for a better deal for all children, and particularly those with special needs. When I spoke to Esther about the results of the survey she was truly shocked and said the following…. I realise the Government is cutting back on everything at the moment but this problem is a real time bomb and if we don’t address it now we will have a growing generation of adults who are unable to integrate in or contribute properly to society. If we don’t do something now we will face much higher costs in the future when we have to care for those with ASC.